ChessRex.com has futuristic graphics design for a multitude of chess sets. Bellow is a serious Chess Knight named after the Great Robert James Fischer. The newly developed chess set has character and attitude well attributed to Fischer’s character and play. Fierce and serious with a dark side this Chess Knight looks menacing on the board. The Fierce Robert James Fischer Knight at ChessRex.com. Tension over the USA and USSR and the long standing cold war drew worldwide interest on this Chess match, two Super Powers were going to face off on the chess board. Reykjavík, Iceland 1972 Robert James Fischer met Boris Spassky for the World Championship. On July 11th, the “Match of the Century” had begun Robert James Fischer vs Boris Spassky. The drama surrounding the match on all levels from Grand Masters to Media and government agencies was a result of the High expectations for Robert James Fischer and Boris Spassky. After 21 games of a possible 24 games the match was over on August 31,1972, with Robert James Fischer winning a game after 7 consecutive draws. These games start at the point when all is online.. exchanges have been made and the battles for position to claim the board are defined. Have they just reinvented Vote Chess ? Found this interesting and confusing. Have the just reinvented Vote Chess ? 500 million for Vote Chess ? I know other sports are in that estimated figure but please come down to Earth Awol. 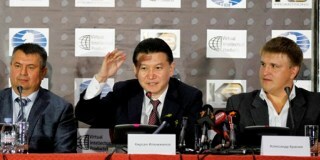 On July 3rd FIDE President Mr. Kirsan Ilyumzhinov held a press-conference in Kiev, during which, together with Mr. Alexander Krasyuk, CEO of “K2 Promotions”, Mr. Anatoly Yatsenko, President of the Ukrainian Draughts Federation, and Messrs. Vladimir Kolomiez and Oleg Savchuk presented a new project : “Geo-social Games”. The Ukrainian specialists have invented and patented technologies that enable any individual to participate with thousands and millions of other individuals in an online game, which previously only played by two. This absolutely new product is intended for world markets of sport, games and gadgets and was invented by World Boxing Champion, founder of “K2 Promotions” Mr. Vitaly Klitschko and FIDE President Mr. Kirsan Ilyumzhinov. The project developers were the first who managed to combine the intellectual and economic component based on the principles of redistribution of winning in a product called “Geo-social Games”. The point of this project is the organization of global international tournaments of intellectual and other sports (chess, draughts, boxing, football, bridge, etc.) by means of information and telecommunication technologies. Each person regardless of his or her social status and means can earn a significant amount and be recognized by his or her intellect. Chess and boxing will be the leading sectors of “Geo-social Games”, which will allow unlimited number of people to be involved in these sports. “To think a step ahead, develop the logic and thinking – these qualities are important not only for chess players or boxers, they are useful in the life of every person. ‘K2 Promotions’ supports this project, as it can become a new global strategy of refocusing the youth on a healthy lifestyle regardless of place of residence and income. Besides, part of prize funds will be directed on the stipends for talented grand masters, young promising sportsmen, on organization and conducting the tournaments. This one of the most important missions of project that we welcome”, said Vitaly Klitschko. “Geo-social Games – project is designed to unite under its wing, people of different religions, races and nationalities, all age groups and various social stratum. A unique symbiosis of physical and intellectual possibilities can change the social image of the planet. I’m very pleased that project is being realized with great sportsman of our time Vitaly Klitschko on the basis of developments of Ukrainian experts”, said Mr. Ilyumzhinov. Thanks to development of modern means of communication the developers are counting for 500 million of active players’ audience within 1.5-2 years. The authors and project developers are Mr. Kirsan Ilyumzhinov, FIDE President, Mr. Vitaly Klitschko, World Boxing Champion, Mr. Alexander Krasyuk, CEO of “K2 Promotions”, Mr. Anatoly Yatsenko, President of Ukrainian Draughts Federation, Messrs. Vladimir Kolomiez and Oleg Savchuk, project developers and coordinators.